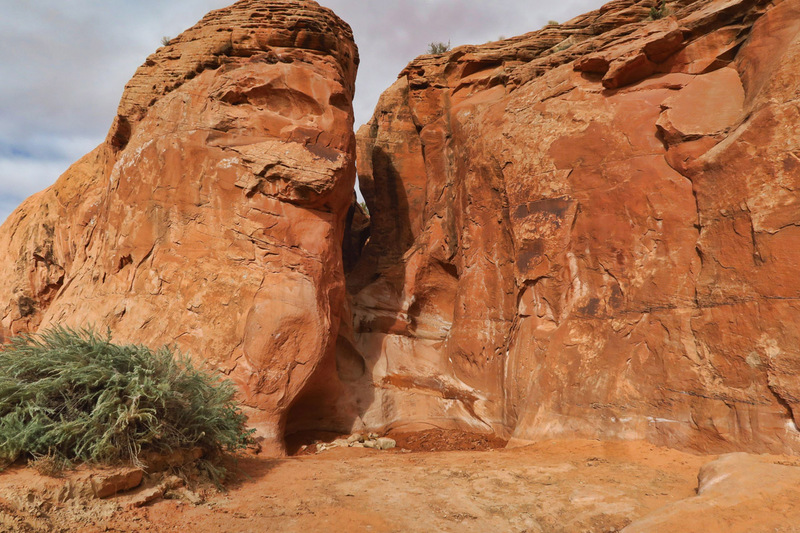 I’ve heard many fellow RVers sing the praises of Escalante before….“boondocking near Escalante, hiking in Escalante, conferring with the Interagency Visitor Center in Escalante.” But I was never sure exactly where in Escalante all this recreating was taking place. 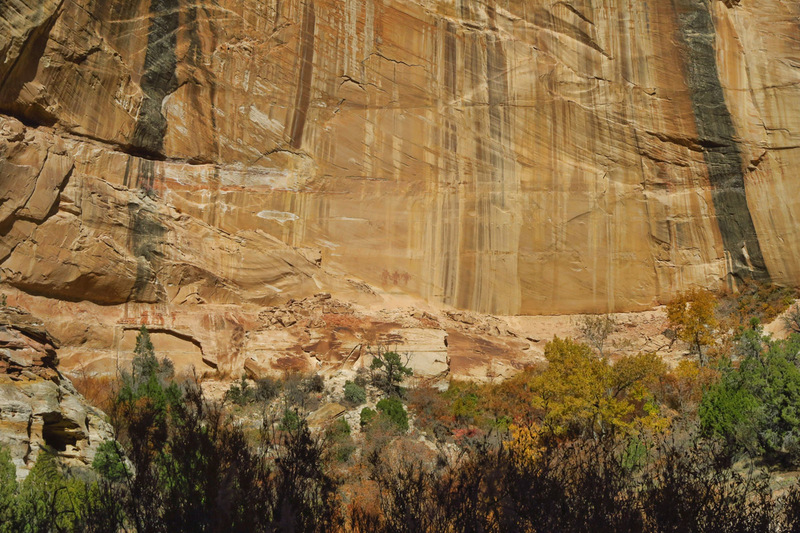 Was it the Grand Staircase-Escalante National Monument, and if so, where? At over a million acres, that’s a huge monument to attempt to explore. But once I began researching Hwy 12, I realized most were referencing the tiny town just south of Boulder that bears the name Escalante, named for Silvestre Vélez de Escalante, a Franciscan missionary and member of the first European expedition into southern Utah. 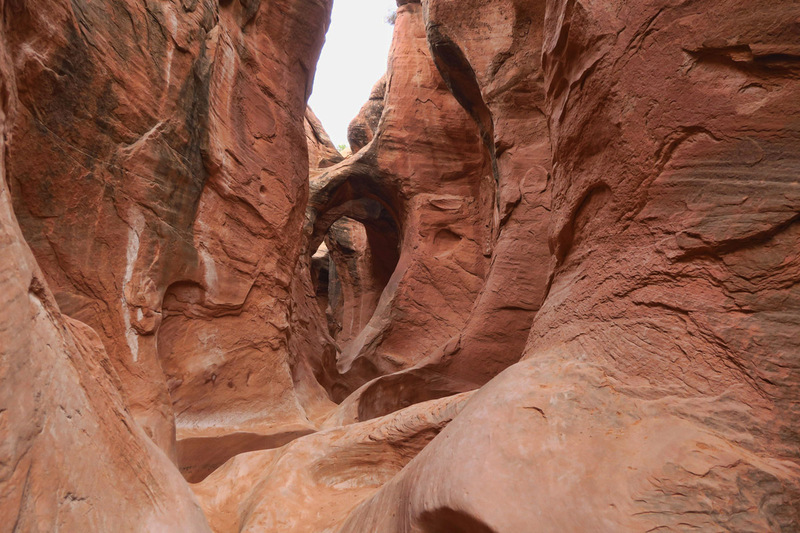 Escalante is on my planned route because it will get me within striking distance of two slot canyons, “Peek-a-Boo and Spooky” that have been on my wish list for several years now. The problem in visiting this area along Hole-in-the-Rock Road is one that I encounter often…crossing off places on a bucket list only makes room for more places! 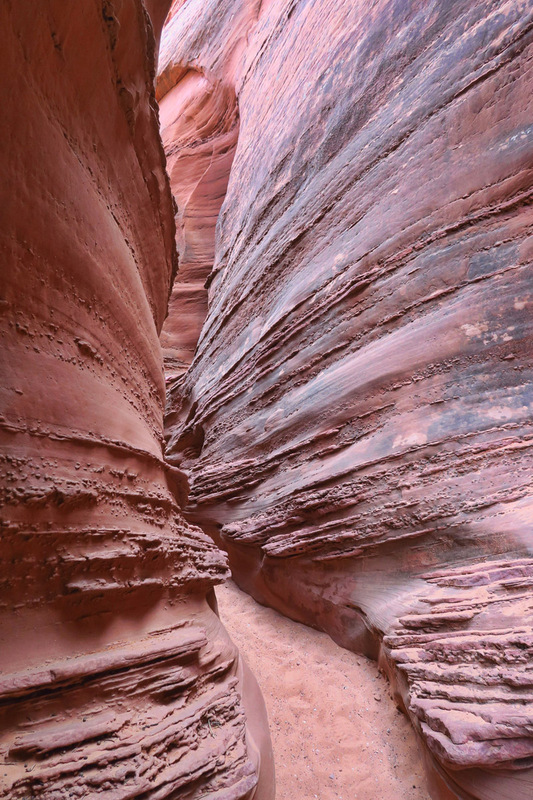 Wow, are there ever a lot of interesting canyons to explore in this area! Always a reassuring way to start a hike. 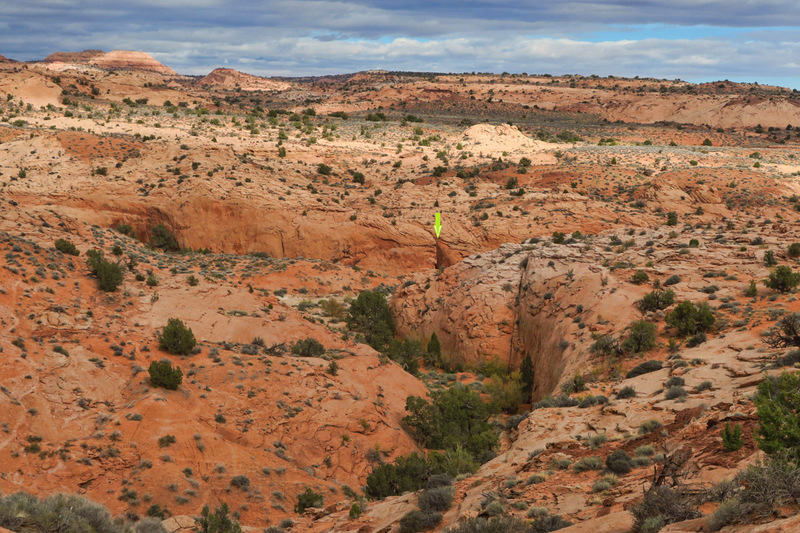 The lime green arrow points to the slot which is the entry of Peek-a-Boo Gulch. 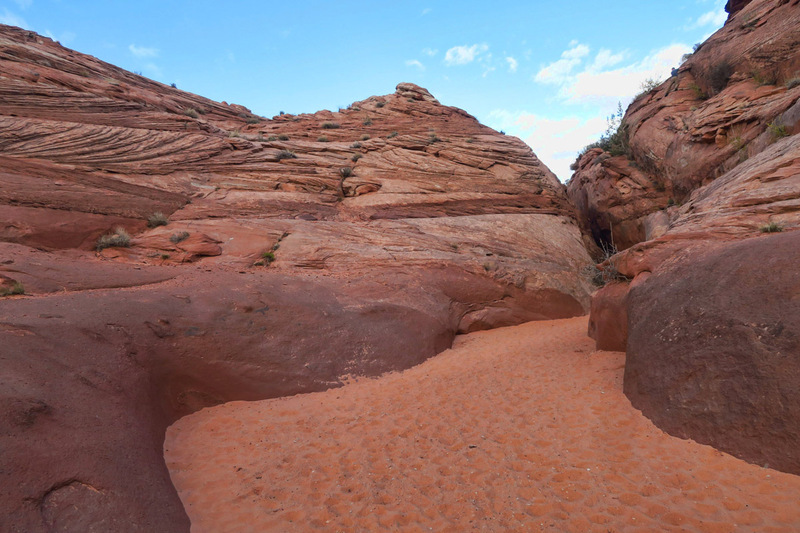 Entrance to Peek-a-Boo Gulch is midway up that opening. Why is this young man wearing a Superman T-shirt you might ask? 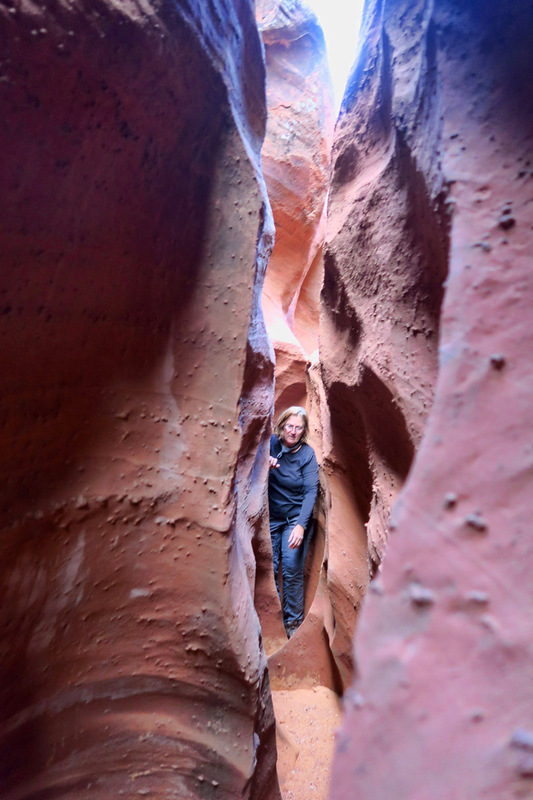 Because he is about to help an old lady cross the street…Or in this case, scale a 16 ft vertical approach into the slot canyon. Looking back down on the pile or rocks and wet sand at the bottom. I left a few patches of DNA on this approach. 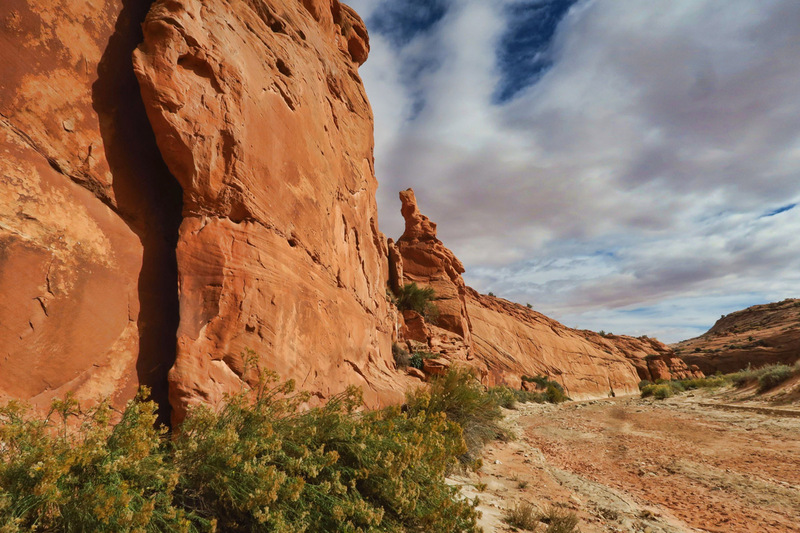 A stop by the big beautiful Escalante Interagency Visitor Center south of town offers up answers to almost all my questions. Staffed with Bureau of Land Management, National Park Service and Forest Service personnel, it’s a wealth of information. I learn there is plenty of boondocking just outside of town with a free permit. I learn that the Hole in the Rock Road is in good shape after some seasonal grading on the heels of heavy rains. 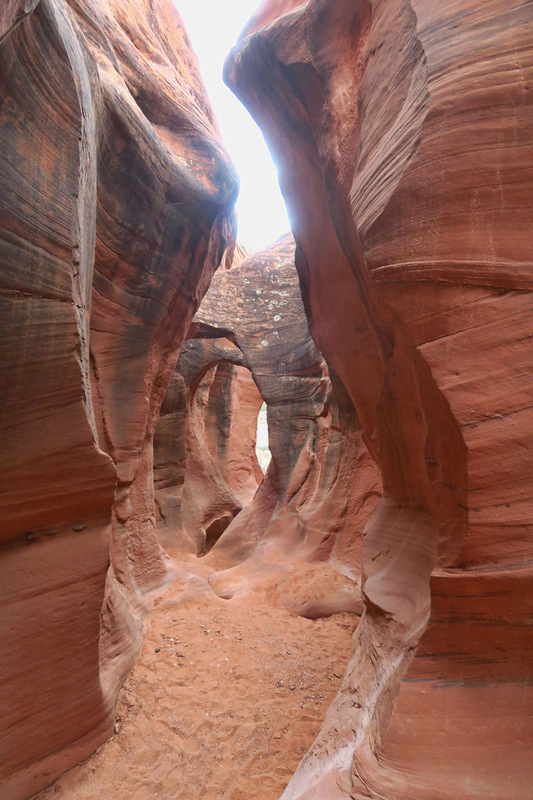 And I learn the two slot canyons I have come to hike are dry and accessible. On a side note, I think this “permit required” for boondocking is a great concept. “Keepin’ ‘em honest,” so to speak. If one has to go to the effort to obtain a permit, even though it’s free, I believe there is an air of accountability attached. I am guessing if the BLM Office records the permit holder’s name, address, phone number, and license plate number, a person is less likely to stay beyond the 14 day limit, less likely to chop down the forest for wood, and less likely to dump their old tires, batteries, broken lawn chairs, sectional couches, raw sewage, etc. etc. 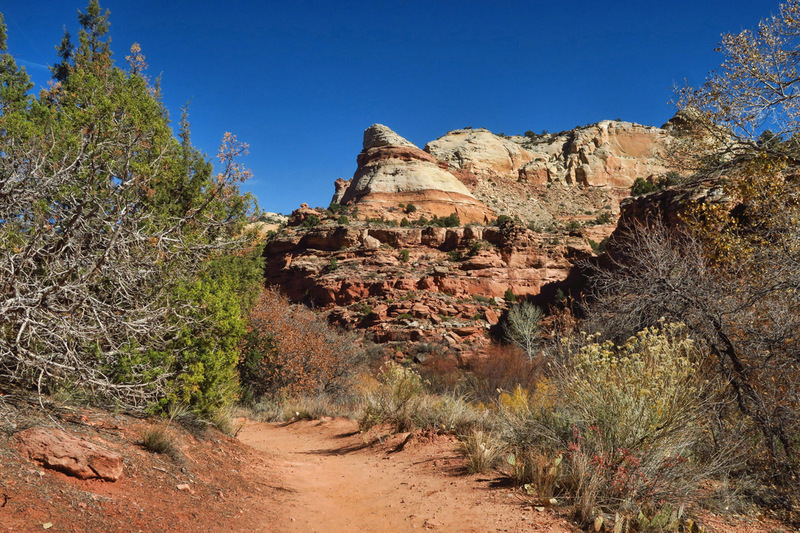 It’s a 26 mile bumpy washboard road from my boondocking spot to Dry Gulch, the turn off to reach the trail head for Peek-a-Boo and Spooky Gulch. Though a bit of a bumpy ride, I am told Hole-in-the-Rock Road is “the best it’s been in months” and I am fortunate to have arrived right after the county graded the road for the cattlemen. It’s the time of year when they transport the herd from summer to winter grazing areas, so the county does road improvements for their benefit. I encounter several cattle trucks billowing up the dust from the recently graded road. 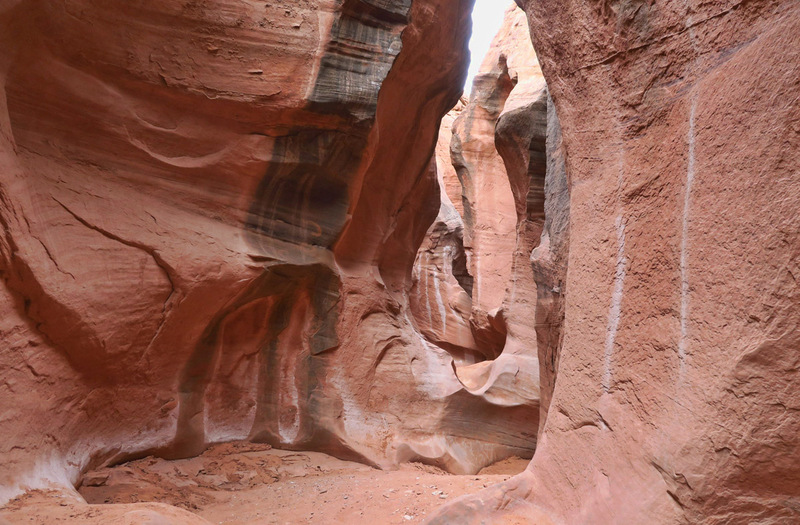 The “arches” of Peek-a-Boo Gulch are just beautiful. Peek-a-Boo is wider and more colorful than Spooky. Looking up through the arches. Even after entering, a bit of hurdling is required to get over the fins. At one point, you think the slot section has ended, but then it starts up again. This ain’t nuthin’ compared to what is yet to come in Spooky Gulch. 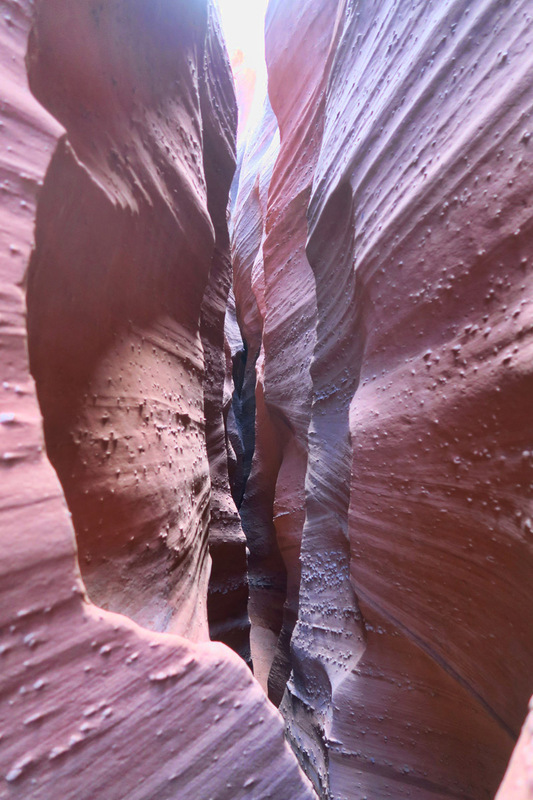 Each of the two slot canyons present their own major obstacle. For Peek-a-Boo, it’s the 16 ft vertical approach to enter the slot. There are footholds, but they are extremely far apart, requiring a “shin to chin” maneuver. 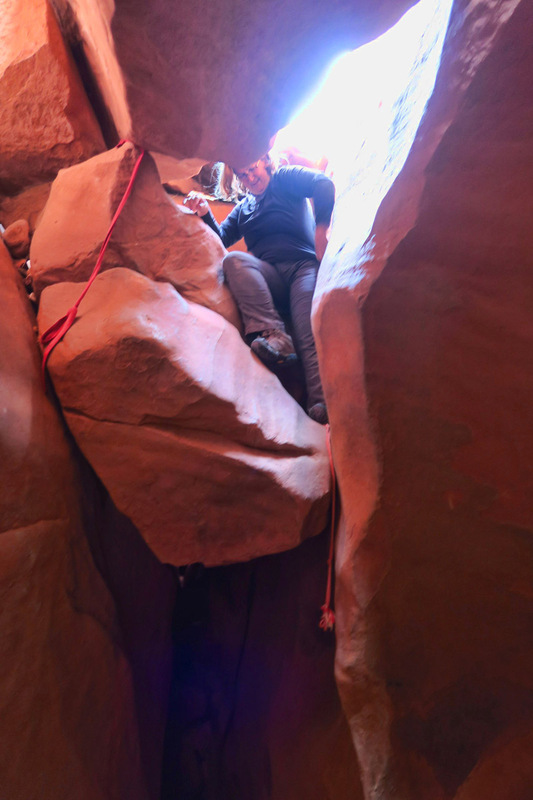 This challenge is compounded by the amount of loose, damp sand littered all over the rock face by previous hikers, which makes gaining purchase near impossible. 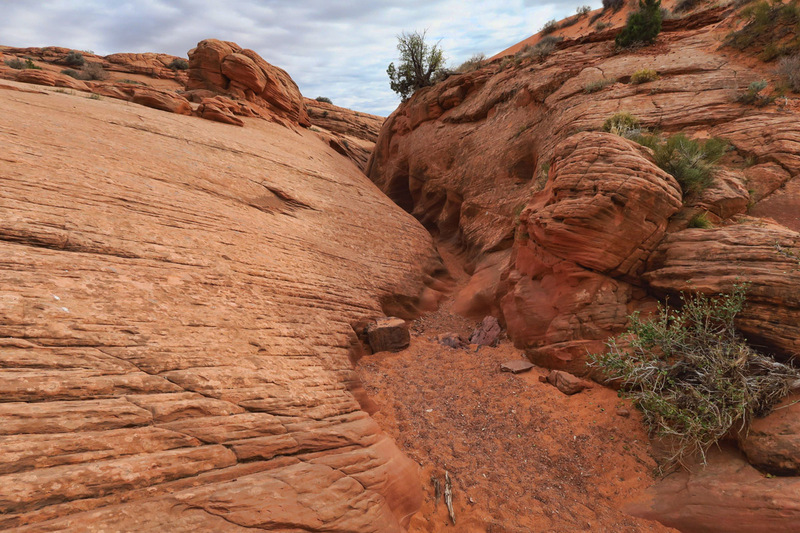 For Spooky, the obstacle is a large cluster of choke stones mid-canyon that must be navigated via a six foot drop. If you can get past those two obstacles, the rest is more mental than it is physical. 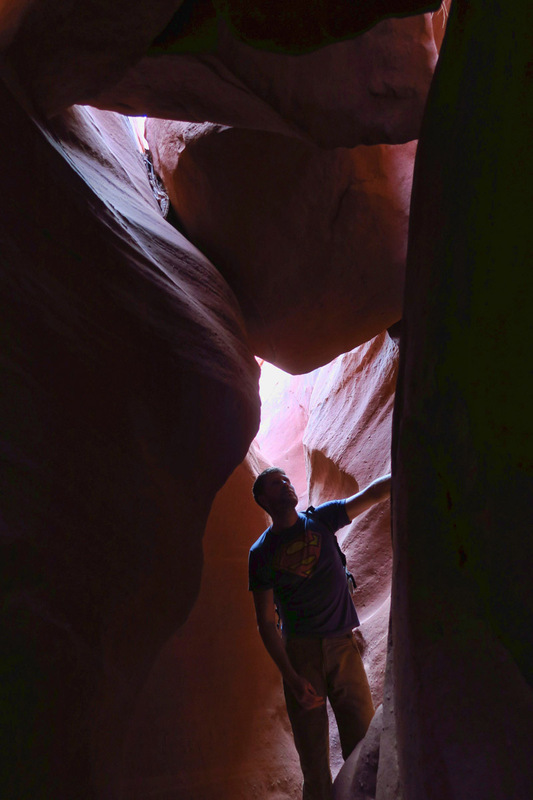 Spooky narrows down to a width of inches in spots, making it a freakish test of one’s claustrophobia. Some sections were so narrow I had to walk “ballet plie-style” as my feet were too long to walk sideways, and my body too wide to walk front-ways. The entry to the “upstream” end of Spooky Gulch. 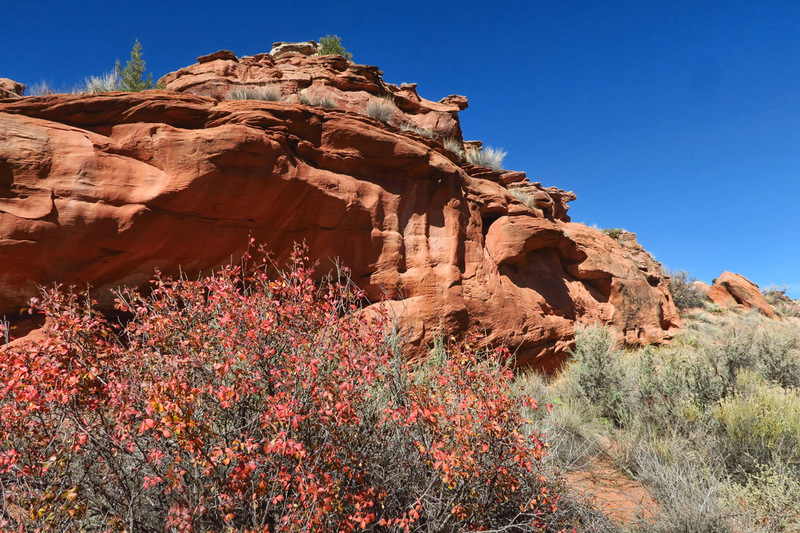 It is recommended that Peek-a-Boo and Spooky Gulches be explored in a loop starting with going up Peek-a-Boo, exiting at the back end, traversing the 15 minute hike over to the wide, dry creek entrance of Spooky, then coming back down. 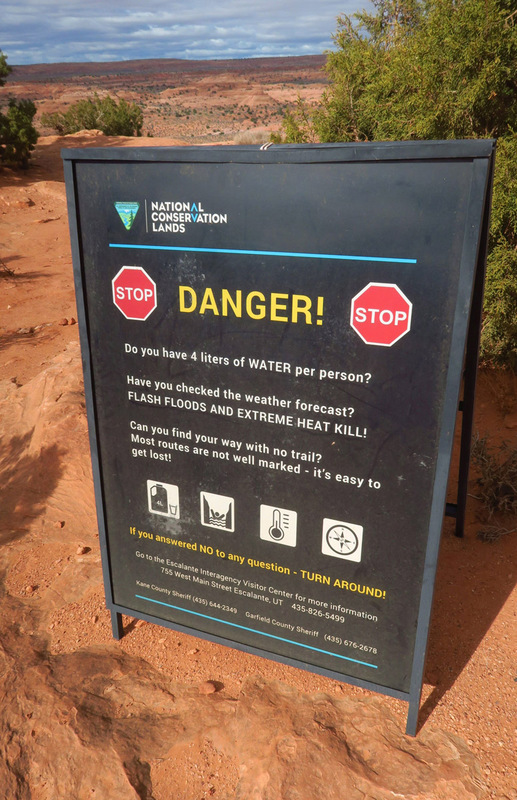 The woman at the Escalante Interagency Visitor Center told me that the reason for this recommendation was two-fold. 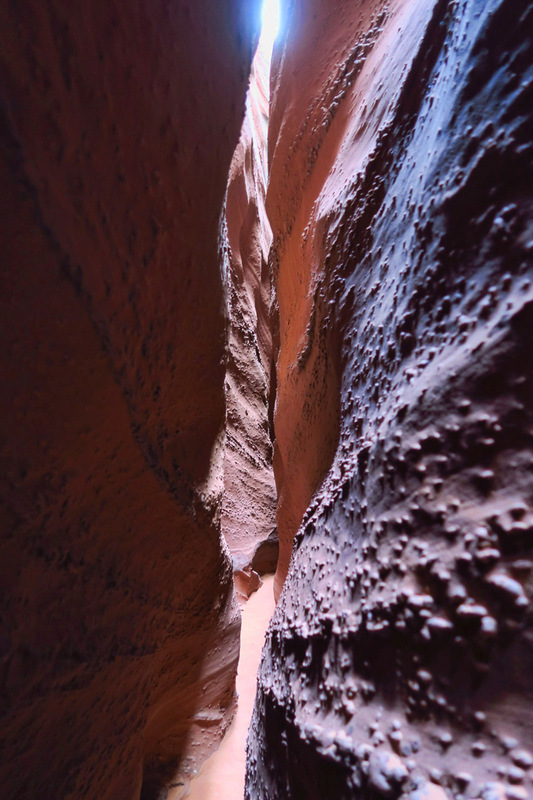 One, the obstacle in Spooky is reportedly easier to descend than it is to ascend, and two, due to the narrowness of the canyon, they’d like to have everyone moving in the same direction to avoid impasse. He cautions, “Don’t use a rope unless you know who placed it.” Oh, sure, easy for you to say. After the choke stones, it’s about to get really narrow. Spooky gets its name from becoming very dark in the center section. Another nuance with Spooky is these rough knobs on the surface. Even in long sleeves and long pants, elbows and knees still get pretty scuffed up. And just like that, it’s over. Another suggestion I read is that backpacks should be left at the opening of the canyon. I strongly disagree. But be prepared to drag your backpack behind you in certain sections of Spooky. I took almost everything out of mine except the bare essentials of food, water, and smartphone, and still it would not fit. But regardless, don’t leave your water behind in the desert! During my traverse from Peek-a-Boo to Spooky, I ran into two different people coming in the opposite direction who had lost their way. The problem is not that the trails are not marked, but rather they are OVER-marked! Severe “cairn-age” exists at the top of the plateau (people who insist on stacking rocks to mark their own way) which can lead to confusion as to which cairn to follow. 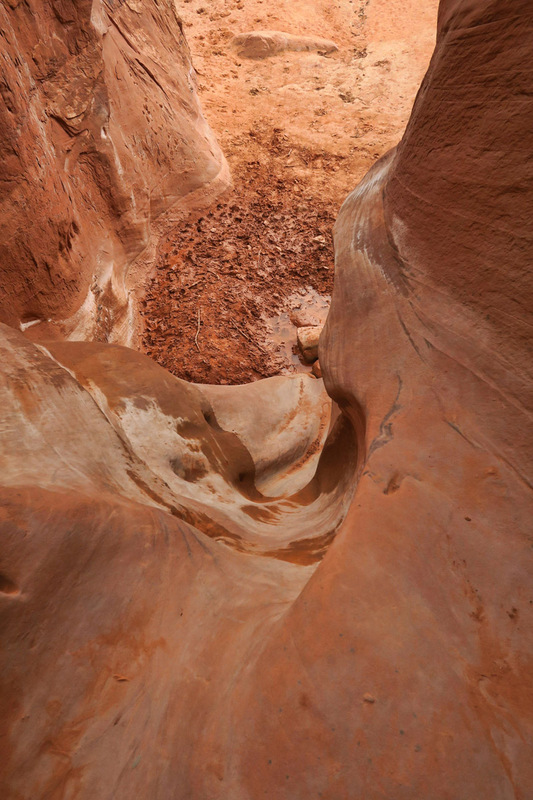 Screen shot of Peek-a-Boo and Spooky Gulch from the Hiking Project app. Feeling a bit “scuffed up” after my day in the slot canyons, I opted for a more gentle hike to Lower Calf Creek Falls the next day. The six mile round trip hike to the 126 ft waterfall at the end is just a lovely canyon from start to end. 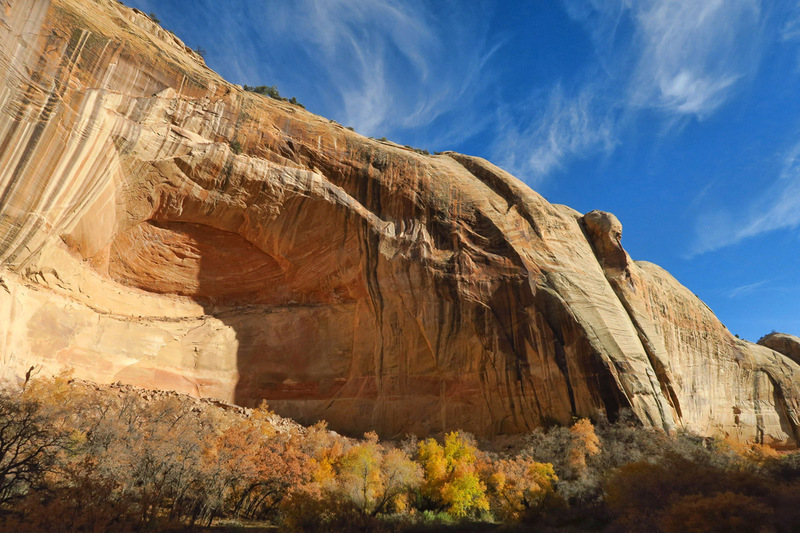 The Lower Calf Creek Recreation Area is only about 15 miles from Hole-in-the-Rock Road. This was such a beautiful hike made more so by the perfect weather. 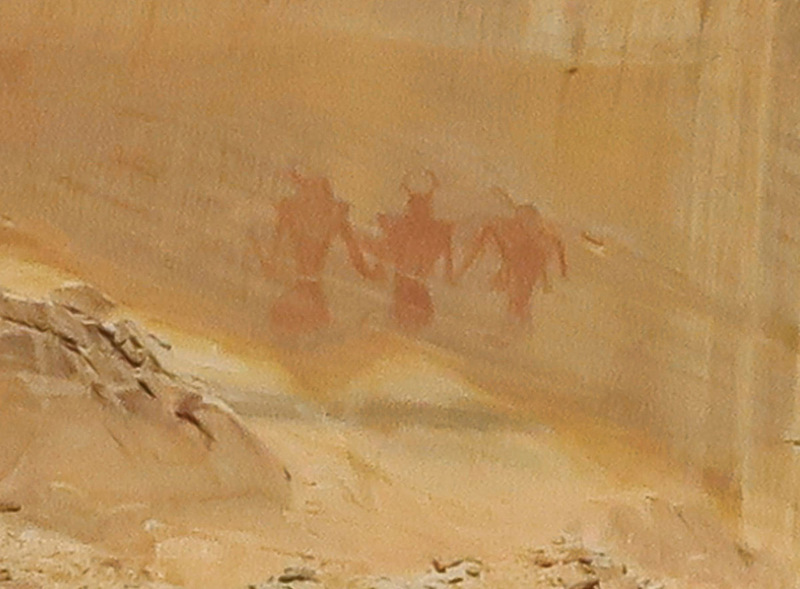 Look slightly below center for “Three Warriors” pictograph. The desert varnish patterns are impressive. First glimpse of the 126 ft waterfall. A lovely lunch spot. I have it all to myself for awhile. The hike back is just as picturesque as the light has changed. Note large “fin” in the center. Interesting late afternoon clouds have rolled in…or is it left over contrails? 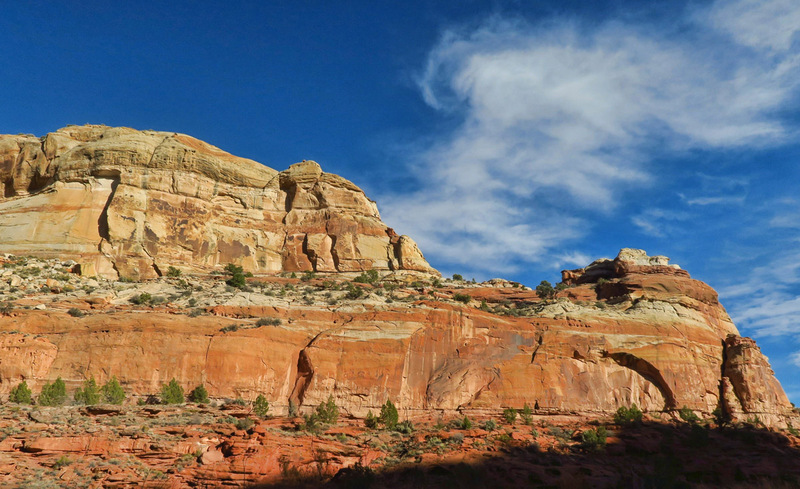 There is so much more to explore in the Escalante area, most of it along Hole-in-the-Rock Road, which is a story unto itself. It’s no mere backcountry road, but rather one built in 1879 with the blood, sweat, and tears of the early pioneers. During the Mormon San Juan expedition, Silas S. Smith led an expedition consisting of 250 Mormons, 83 full-sized wagons, and over 1000 head of livestock in attempt to settle the San Juan River. What the heck is this thing? It was HUGE! 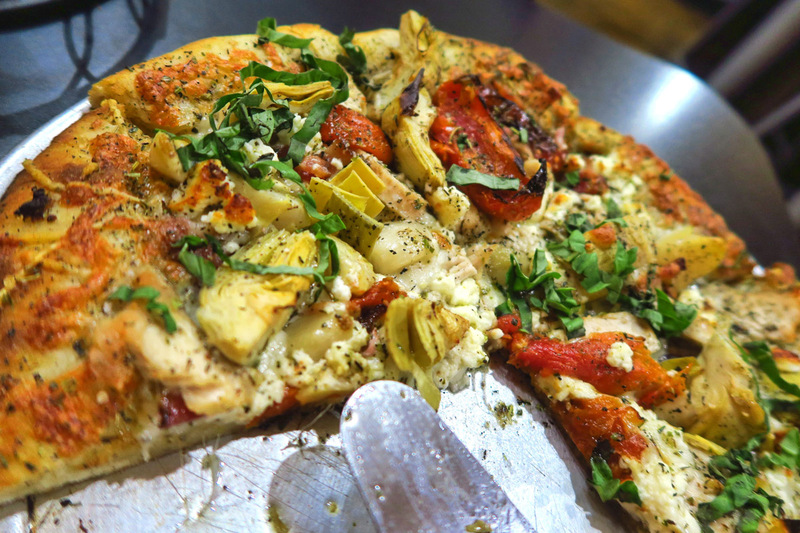 If you end up in Escalante, DON’T MISS the pizza from Escalante Outfitters! 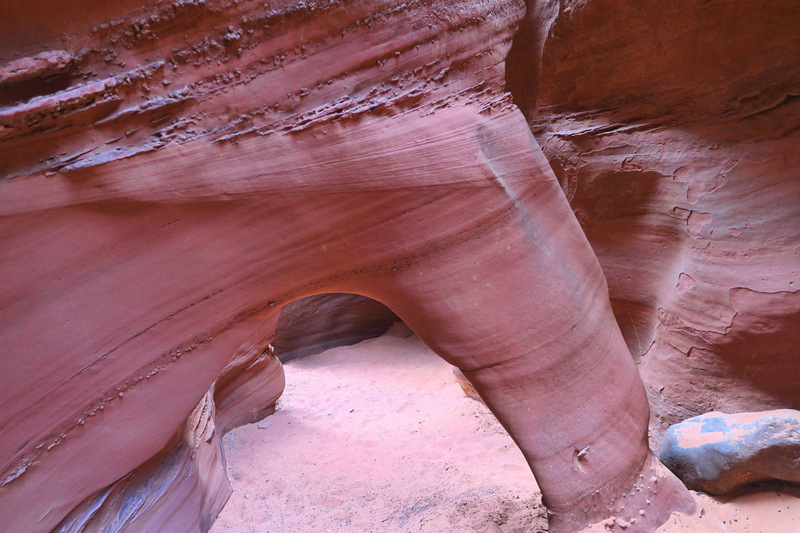 This entry was posted in Utah and tagged Escalante, Hole in the Rock Road, Lower Calf Creek Falls, Peek-a-Boo Gulch, Spooky Gulch by Suzanne. Bookmark the permalink. We are definitely swooning – yet again – at the marvelous photos that you produce, and that we are privileged to view. Wow! WOW and Wow! We so enjoyed this place but my eye was acting up so we headed north to Provo. Hwy 12 may be one of the most spectacular roads in the country. And, that’s a badger. 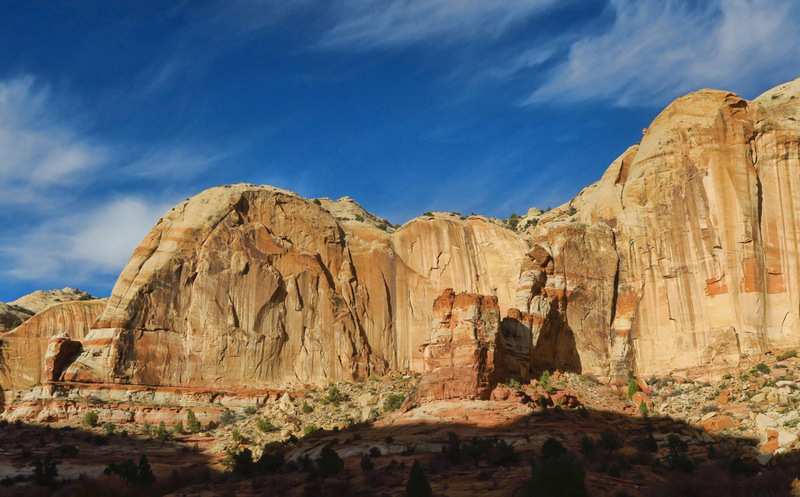 Wow is truly the operative word for the Escalante area. 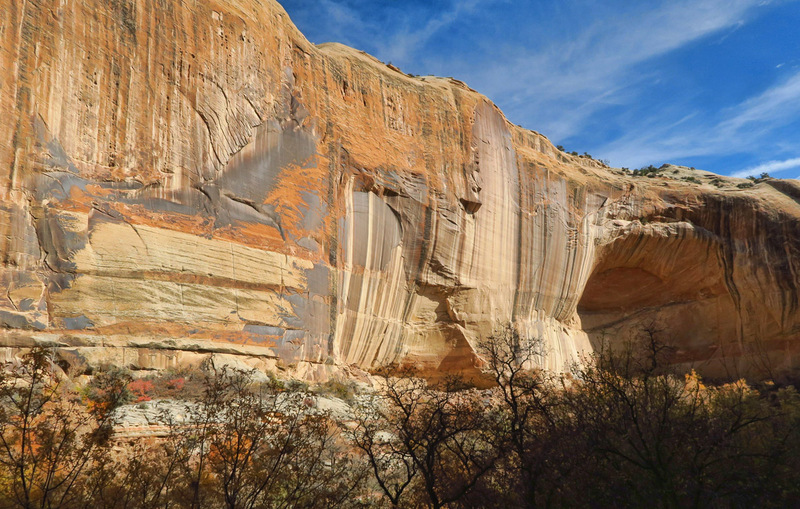 We did a guided canyoneering tour with Excursions of Escalante a few years ago. Also did the Calf Creek hike. Thanks for bringing back the memories of this beautiful area. Your photos of the slots were great as always. 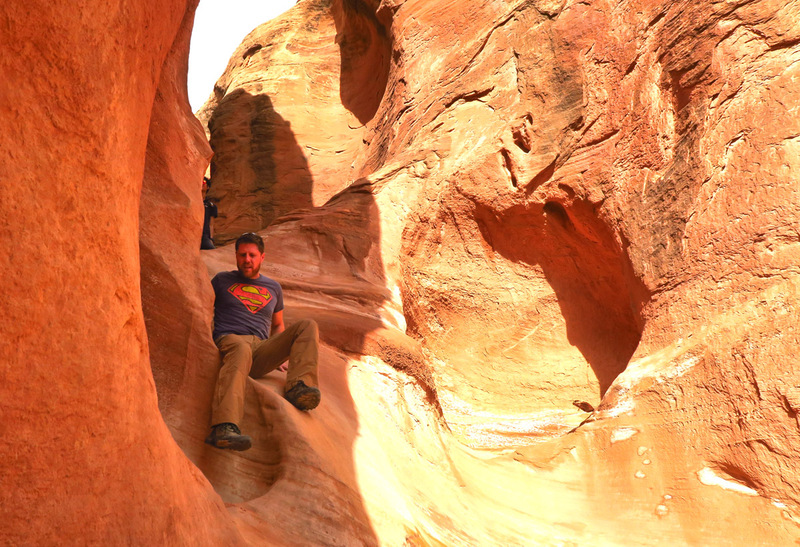 My first “girls” trip with my 2 friends was at Coyote Gulch off Hole in the Rock road. 5 days of hiking, exploring, camping, and just being with friends. So dark at night I nearly got lost finding my way back to my tent after a potty break. Think your furry friend is a badger. While the roads may have been nail-biting in places I think I would have been undone by the Peek-a-Boo/Spooky hike. I’d have been terrified of getting lost…or bouncing down the drops. So fortunate to have Superman nearby! 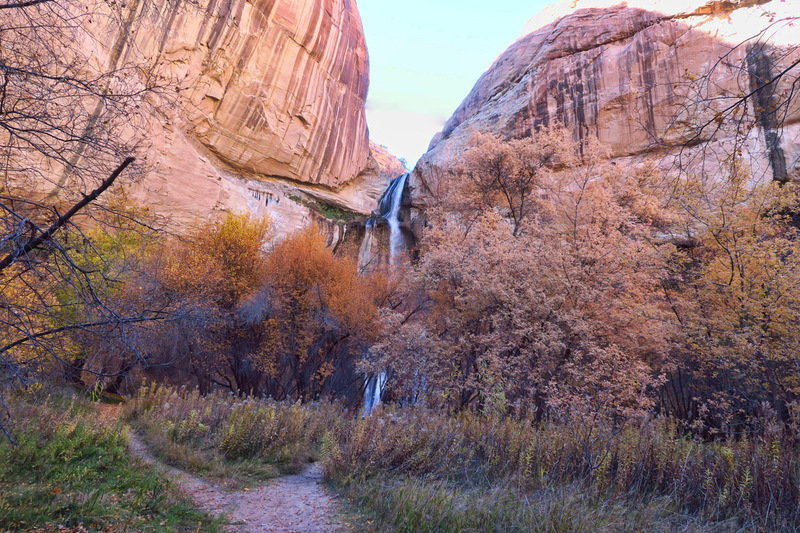 Love the Lower Calf Creek Falls hike though. Thanks for the mention of the app…and the beautiful photos and descriptions, as always! 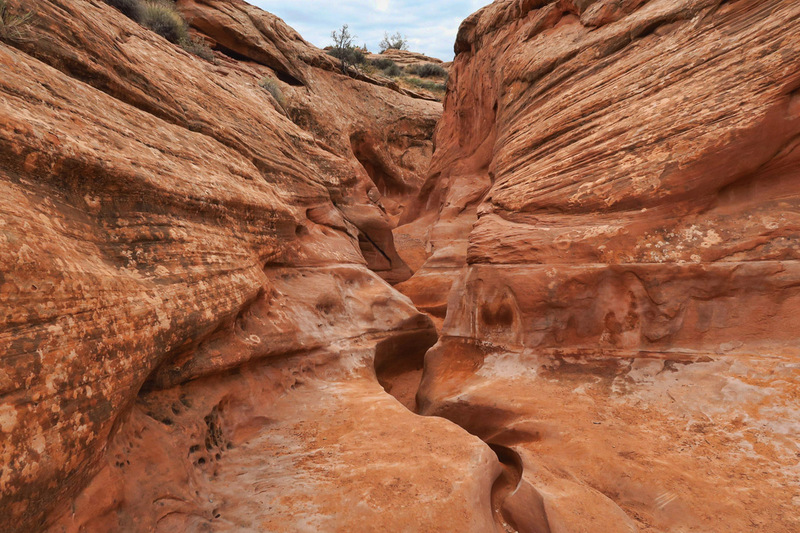 Beautiful, we have never been but love slot hikes so may have to put it on our list! 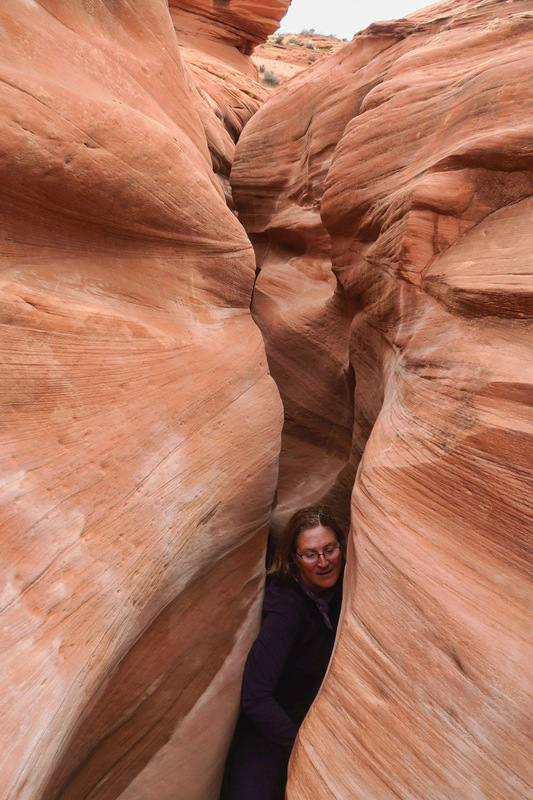 Never in a million years could I fit through that slot canyon! Don’t think I would have the guts to make it through those obstacles even with Superman’s help! I remember seeing the film about the Mormon pioneers and Hole in the Rock Rd at the visitor center in Bluff and being amazed at their tenacity. I wish this NP wasn’t so rugged. You really need to be a backpacker to fully appreciate this area. 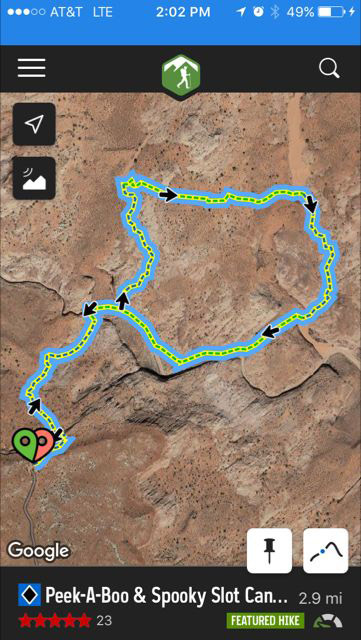 Boy did you luck out with both canyons being dry AND a graded road! Almost everybody else I’ve read about doing these two has had water in parts. Glad Superman was there to help:) I believe your new “friend” is a badger!? 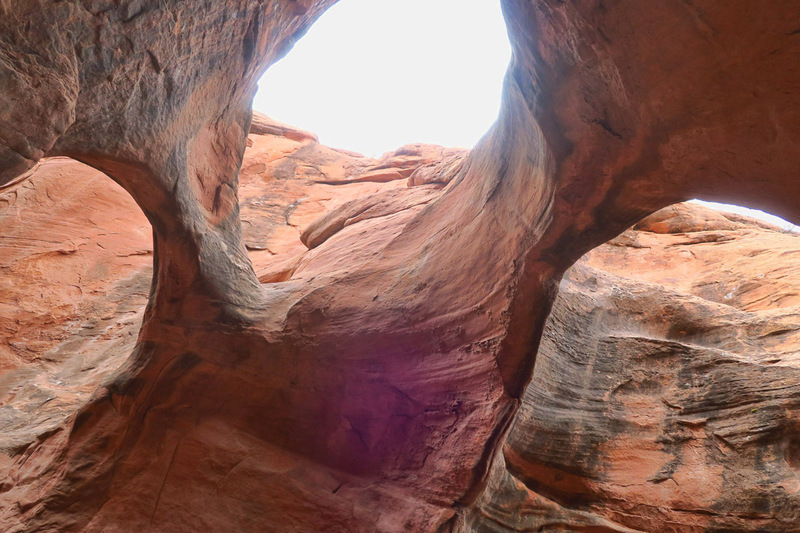 Ahhhh, Spooky and Peek-a-boo…one of our very favorite hikes ever! 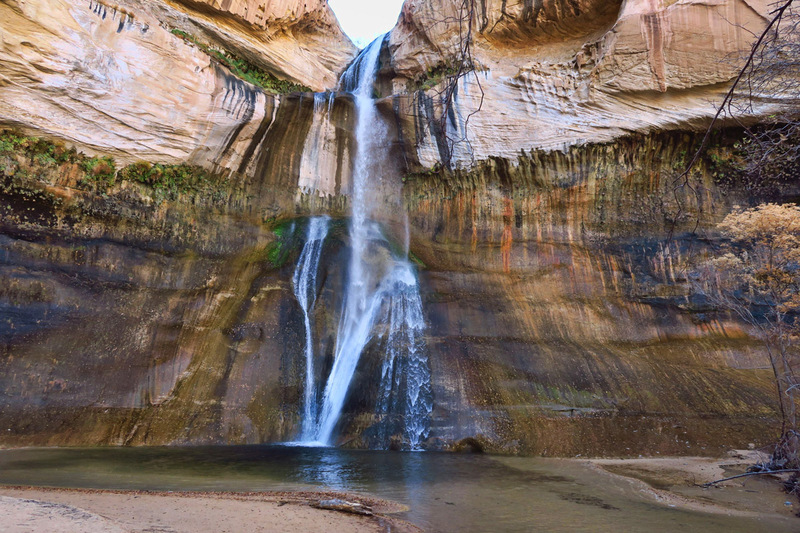 And you can’t go wrong with Calf Creek Falls, especially when it’s not very crowded. Good memories! 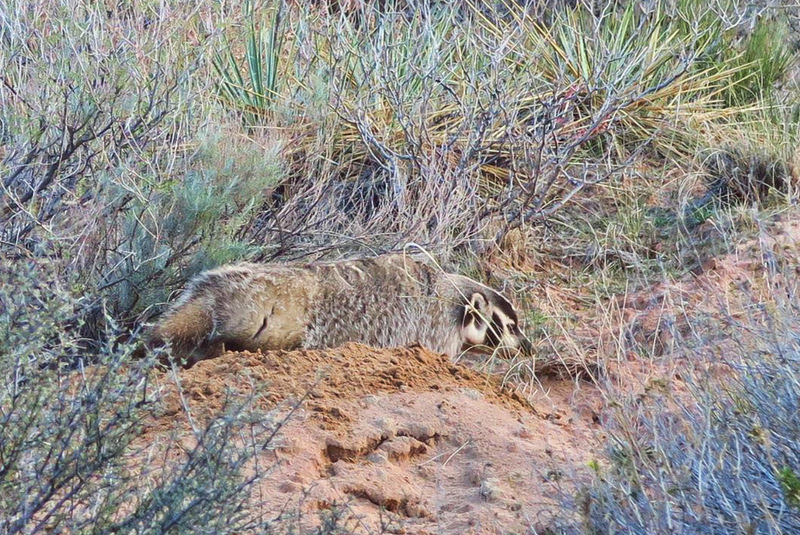 I think that’s a Badger – good thing it was asleep – that encounter could’ve equaled the spookiness of Spooky Gulch! Beautiful country. Your photos are simply stunning Suzanne. Thanks for sharing as this is the only way I will ever see those slots. My claustrophobia almost kicked in just looking at your images! The hike afterwards does look lovely.